When lightning strikes, it is sudden, intense, and potentially fatal. If someone has seen lightning strike in person, they will usually take preventative measures to avoid being struck by lightning. That was not the case today, though. Despite an occurrence as rare as a lightning strike in the form of a goal by Matri, Milan let themselves be struck by lightning for a total of three goals, and a loss of three points. It all started well enough. Allegri did choose the 4-3-3 formation, and an interesting forward lineup of Birsa, Balotelli, and Robinho. He also fielded Poli instead of his usual Muntari, and Gabriel in goal ahead of Amelia. But just ten minutes in, lightning struck. Biabiany flashed by, leaving Constant wondering what happened, crossing the ball in. Abate was there, tried to clear the ball, but failed, leaving the perfect opportunity for Parolo to step up and take the shot. Goal. 1-0 Parma. Milan were not without their chances. But Parma were taking chances, too. However, in the 34th, and you had to know this was coming, Balotelli saw yellow for simulation, which is also an automatic €2.000 fine, too. In the 39th, there was a beautiful play from Poli to Birsa over to Robinho, who just couldn’t seal the deal. But it was in stoppage time that saw lightning strike… again, Biabiany streaked through and put the cross in…again. This time, it was Cassano, kicking the ball straight through Montolivo’s legs, who took the shot. Goal 2-0 Parma. And memo to Cassano, as if you weren’t horrible enough already to the team that saved your life, if you’re going to be a complete idiot and celebrate, please take some dance lessons. This is where Allegri should have told everybody to get out of the water, put up a lightning rod, or whatever other preventative measures he could think to use. But he didn’t. The second half started with the same lineup, and Biabiany still unchecked. So it started the same as it ended… another Cassano shot, this time saved by Gabriel. In the 51st, Constant struggled again trying to mark lightning… I mean Biabiany. Although this time around, Zapata was able to block Cassano. Thinking Allegri had finally learned about the lightning, he made a double sub in the 52nd. 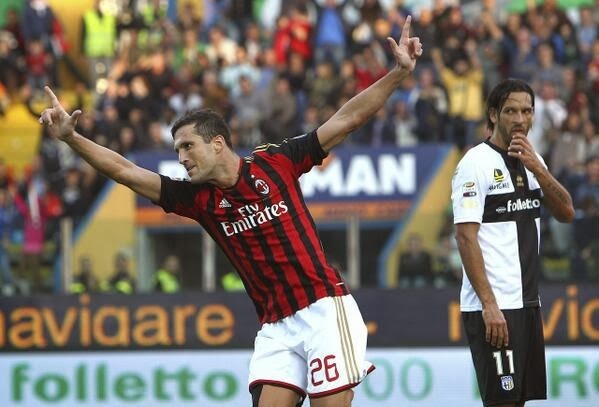 Only it was Kaka and Matri that he brought on for Poli and Balotelli, respectively. 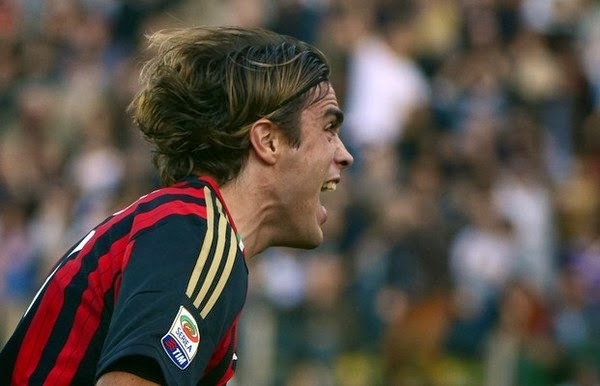 And he switched to what looked like a 4-3-2-1, too, with Matri as the lone striker. Which was a bold move for the attack, but still didn’t address the defensive issue. Maybe he thought that by maintaining 66% possession, we could avoid the lightning, I don’t know. But down 2-0 at that point, it was kind of like his “throw on all the strikers” tactic, but about 30+ minutes too early. Even a blind squirrel finds a nut sometimes. Well done, Matri. 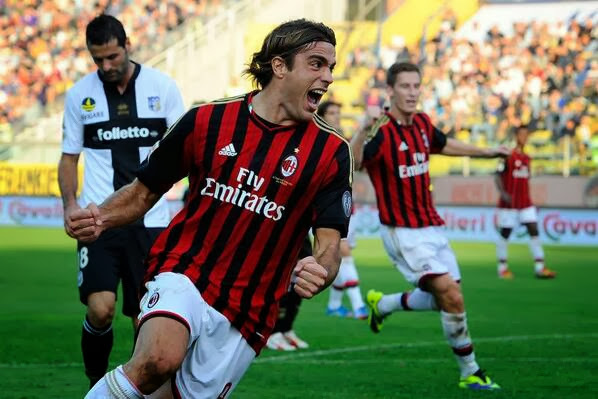 Well Milan fans also forgot about the lightning, because in the 60th minute, something even more amazing happened: Matri scored. 2-1 Parma. Yes, our favorite ball of clay finally did what we had been promised he would, and we were back in the game. Biabiany who? And his other sub, Kaka, was on the prowl, too, with a shot saved in the 62nd. Then something even more amazing happened. Milan scored from a corner, with a header. That’s right, in fact you could call it a double header, since Zapata headed the ball for the assist to Silvestre, our backup defender. 2-2, game on. But the highlight of the game was yet to come. Gabriel, in the 70th, went to punch the ball away, and made contact with Cassano instead. Brilliant. Even better that Cassano was unable to continue and had to be subbed off a couple of minutes later. I’m calling this as a KO for Gabriel. Well done. If you can’t hit them with goals, then literally hit them. My hero. LOL Amauri. You just got Silvestre-ed. There were plenty of missed chances by Milan, like a Birsa free kick in the 70th that just curled over the crossbar, or in the 82nd when there was some brilliant play by Kaka. But there were some chances for Parma, too, on account of Allegri not having properly addressed the glaring defensive problem. De Jong saw yellow for a foul in the 83rd, but this ref made the right call and did not send him off, because it was too far out to be considered a clear goalscoring opportunity with De Jong being the last defender, a more fair and functional interpretation by the ref than some have made recently. Lucarelli didn’t think so, though, and was booked for protesting. 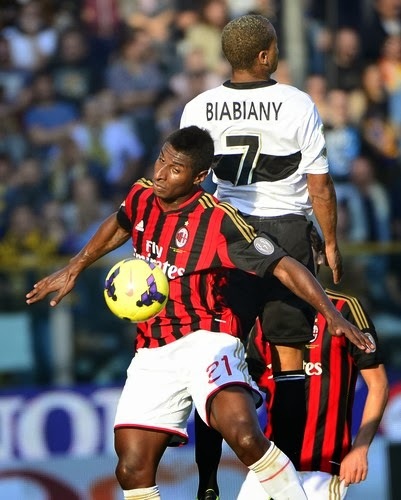 Saponara came on in the 88th for Robinho, making his Milan debut in a classic Allegri substitution. Gabriel made another amazing save in the 90th, he was absolutely the right choice keeper tonight, despite having conceded the three goals. Zapata saw yellow in stoppage time, and then lightning struck again. Only this time it was a Parolo free kick. With the Milan “wall” opening right up between Matri and Birsa just perfectly for him. Thanks, guys. 3-2 Parma. And so a game that was lost and then found was lost again. The team played okay, not their best, but certainly not their worst, and that 90 minutes of determination was only visible from the ones in the white and black uniforms from where I sat. 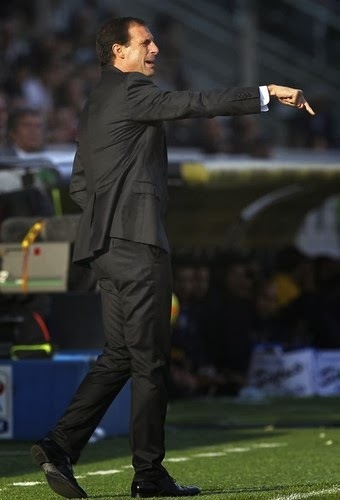 The vapid tactics of Allegri were on blatant display. As he said yesterday, “I am the Coach and I make the tactical decisions.” Therefore, this one is on him. He did not read the game correctly, he used his typical “let’s score more goals than we concede” theory, but it was after we were already down two goals. I used to think our poor defense was a result of poor quality defenders, but it is becoming more and more obvious that the team is not coached well defensively, the midfield doesn’t have any idea how to jump in and help out the defense. There were some great moments or performances today. De Jong was a beast. The aforementioned Gabriel deserves another mention, he can’t get experience fast enough for me to be ready as a starter. Despite not getting on the scoresheet, Kaka did amazing, although should have scored at least twice. Birsa rocked his first full 90 minute game, I was very surprised with how hard he played. Poli did well, too, and Zapata did better, too. If you say it's on you, I am not going to argue. The flip side was that Constant, of known questionable defensive and positional issues, was completely exposed and embarrassed today by the lightning speed of Biabiany. Allegri said he subbed off Balotelli because he was on a yellow and wasn’t playing well. I may be in the minority, but I actually agree that this was a good call. And hopefully we see a much better performance on Wednesday from our superstar. But collectively, the team did not do enough. It’s not enough to throw on fresh legs and score a couple of miracle goals. You also have to defend for 90+ minutes, and it was that “plus” that cost us the one point, the 90 minutes that cost us all three points. Maybe Allegri will never learn, but hopefully the boys will learn from the lightning. Because it’s never good to be around when lightning strikes.